Fate Fuel came across my radar while I was browsing Instagram. Where else? My explorer view on Insta somehow knows exactly what I am interested in, so whenever it identifies a muscular individual with ANY sort of workout supplement, it knows to show it to me. The crazy thing about Instagram to me is how freakin good that algorithm is at finding new and relevant stuff to show you. I swear that I have a dedicated account manager that sits at a desk and just finds awesome new handles for me to follow. Absolutely love that. So I was browsing the other day and I came across a picture of a supper fit chick and she was doing squats with a bottle of what I knew had to be a pre workout in front of her. I’ll admit to you right now that I creeped her for like twenty minutes. And I think I have a legit girl crush on her. Her handle is devan_ess and I highly recommend that you go give her a follow. She’s just incredibly attractive to me and posts some really motivational stuff. I guess some of them are a little racy so you’re totally going to question my sexuality but don’t think of it that way LOL. She just is clearly super dedicated to her goals and it makes me want to emulate her. I guess I have to give Fate Supplements props on signing this one though- she really does know how to sell. I have the perfect excuse because I write supplement reviews, but I think I would’ve bought this stuff anyways. So that’s how I found Fate Fuel- now let me tell you if it works! Support Lean Muscle: This one is a big ‘heck yeah’ in my book. Fate Fuel did so much for my physique and in a super short amount of time. I could tell basically within the first week that my arms just had much more lean, quality, meat on them then when I started. This could have been my absolute favorite part of taking Fate Fuel because my biggest weakness is just gaining enough lean muscle to really go and get that definition. Boost Strength: Again, this is a resounding ‘yes’ from me. We can go ahead and check this box in Sharpie. It goes hand-in-hand with the first claim in that the more lean muscle you have, typically the stronger you are. In fact the boosted strength is the catalyst to putting on the lean mass, because when you’re putting up heavier weights for more reps, your body has no choice but to respond by putting on that additional muscle. I felt incredibly strong when I was taking Fate Fuel pre workout. I think I set PR’s on almost every exercise as a matter of fact. With the exception of pull-ups maybe, but that’s because pull-ups are the devil. Improve Mental Focus: This is an area where I think Fate Fuel could actually improve. As you know from my other reviews, I give it to you straight. I’m not going to sugar coat it and say EVERY single element of this pre workout is perfect- because it’s not. It’s a super product but in some areas there is absolutely room to make it better. If Fate were to make a Fate Fuel 2.0, I think they could put a little more thought into the nootropic and focus properties of this pre workout to really give you that ‘tunnel vision’ that some of the other products do. Increase Endurance: I took Fate Fuel mostly for my strength training days because it has the creatine HCI in there, so I can’t really speak to the endurance element in a cardio sense. But within my strength training there are certainly cardio elements built in. I’m a disciple of volume training - or the practice of using lighter weights for higher reps, so I can tell you that Fate Fuel does do a fantastic job of helping you power through those difficult rep ranges (talking 15-25). Promote Clean Energy: It’s not too too hard to build in a good energy engine into a pre workout- and I’m happy to report that Fate Fuel did a good job making sure that their pre workout supplies all the energy you could ever want in their product. Fate Fuel gives you a fantastic jolt of energy after just a few minutes of drinking it. The energy feels warm and inspirational. I really enjoyed this feeling before heading into the gym. You felt like you could handle any workout that was thrown at you. And often times, I did handle it with the help of Fate Fuel. Enhance Performance: I think of this benefit sort of like an amalgamation of all of the previous effects rolled into one. I mean, what does ‘performance’ really mean? To me it means strength, endurance, energy, and focus. These are all of the things that we already covered off on. 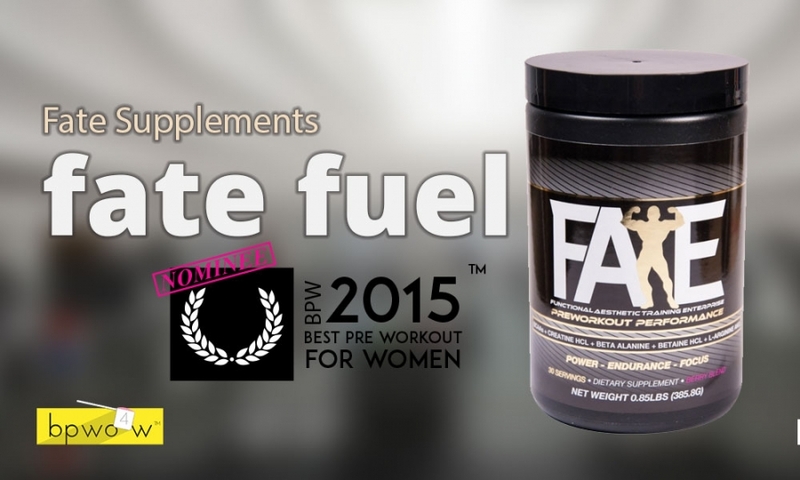 So I’d say with the exception of focus, Fate Fuel does a fantastic job of enhancing your performance. Well. The formula is good, and it performs quite nicely. But it doesn’t taste that great. And the packaging is sort of lackluster in my opinion. Of course I’m the packaging Nazi as you know. But that doesn’t mean that I don’t know a good looking product when I see one. Check out my StrongGirl reviews- I was head over heels over that beautifully crafted package design! Alas, Fate Supplements is not quite on that level with the way they’ve dressed their Fate Fuel pre workout. The biggest problem in my opinion is that it doesn’t say ‘Fate Fuel’ ANYWHERE on the bottle! I’m not sure how they expect people to find and buy this product in a brick and mortar situation if you literally don’t know that this is in fact Fate Fuel. The other problem is that the word ‘Fate’ itself is not very easy to read. I guess the flexing dude is supposed to be the ’T’ in the word ‘Fate’- but the way things are arranged he just ends up looking like, well, a flexing dude. Not a ’T’ at all! If I were seeing this for the first time without knowing anything about it, I would probably read it as ‘FAE’. Like ‘Bae’ but with an ‘F’. LOL. The color scheme and background graphic is also kind of brutal. Just plain black with a generic gray stripe pattern as the backdrop. I just don’t know about this stuff if I’m looking at it on a shelf. It looks so generic and boring that you would never know that it’s actually a really solid product. Let’s wrap things up with the main takeaways of this review.